After my latest blog detailing an example day of my food intake, I got some pretty good feedback. I try to answer my comments and questions as quickly and thoroughly as possible, so in honor of that I am actually going to make a blog post or two on some of the feedback. Q: I was little surprised by the quantity of fresh fruit. The glycemic load is obviously balanced out by the other parts of the meals, but it’s still a good amount of fructose over the course of the day. If you wanted to cut some calories out of this plan, would that be where you would go first? A: First off I do what to say that I agree with the premise that a large daily consumption of fructose could potentially be very problematic, with connections to high triglycerides, visceral fat, metabolic syndrome and possibly even Alzheimer’s (and more). The research on this topic is growing and is pretty consistent across the board, but to take this research and extrapolate it to mean to not eat fruit is just plain silly. It’s like making a mountain out of a mole hill. Yes there is fructose in fruit, but on the average of 7-10 grams per serving. Some have a little more (apples/pears), some have a little less (berries) but it all averages out in the end. A great blog on the topic of fructose and its potential for health problems was done on the Precision Nutrition website here. She points out that to consume as much added fructose as the study participants, on a 2,000 calorie diet it would require more than 20 apples per day! On my diet, where I am definitely consuming more than 2,000 calories, it would take even more. Now that would be excessive fruit consumption. A second point is that fructose barely causes a blip on the glycemic index, due to the fact that it has to travel to the liver first, and since fruit is still generally pretty low in carbs per serving, it’s glycemic load is very moderate, so it is just irrelevant, but I digress. That gives me a total of approximately 40 grams of fructose intake from fruit. Sure there will be a little more maybe from the peppers etc., but definitely no more than 50 grams overall at the most. This is not a problematic number, especially since I am maintaining my weight. Most of the research showing problems with high fructose intakes has people on hypercaloric diets, in research where people are in a caloric deficit but taking in huge amounts of fructose there are little to no problems. 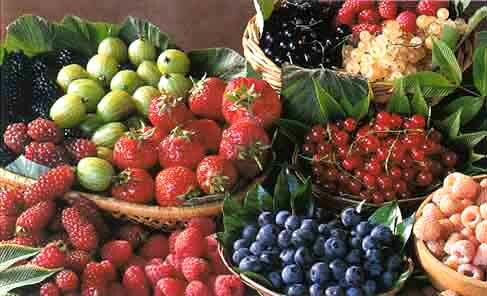 One last point is that I am also getting my fructose intake from high quality fruit, providing me tons of fiber, antioxidants, phytonutrients and a touch of sweetness to my meals that I enjoy. I am also an active guy, training 4-5 days per week and am on my feet all day at work. So a long answer to a short question is that no, I don’t feel that amount of fructose intake is a problem. When dieting, especially in low-carb situations, I do think that my fruit intake might come down a smidge, but not a whole lot since I do want my limited amount of carbs to come from high-quality nutrient-dense sources. If you want more info on that, please check out some of my previous blogs about low-carb dieting such as: Low-Carb Dieters: Eat Your Fruit & Carrots (my second blog ever), Warp Speed High Carb Day, Warp Speed Normal Day, and Warp Speed No Carb Day. Hope that helped to clarify a little misconception and help you realize that fruit intake isn’t your fructose problem, too much sugar and HFCS is. I have done a few previous Day in the Life examples before, detailing my food consumption for the day under different circumstances; you can check a few examples here and here. Now that I am older and wiser I like to think that my nutrition is that much better. I could certainly even take it up another notch or two, but there are budget limitations, so I do the best I can with what I’ve got. To make things easier for you guys, I also provided links when I could showing you the exact products that I like and use, hopefully that helps! A little earlier than I used too, but I don’t mind. I absolutely love omelets, I would say I have this omelet 5 days per week, sometimes I just get lazy and make scrambled eggs sans veggies. I will also often have an Ezekiel English muffin with a little natural pb and maybe some organic fruit spread in place of the oats. My supplement regimen certainly isn’t extravagant or fancy, but it does the trick. I have been playing around with having a protein shake before I train again. Though I usually prefer real food meals, I just felt like lately food had been sitting heavy before my training sessions, so I am just doing some experimenting. Water – lots of it. I love this meal, especially post-training, lots of good stuff here. Some high quality starches, delicious fruit, veggies, lots of protein, fiber and plenty of monounsaturated fat. Plus it is tasty as hell. 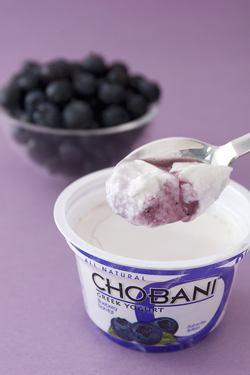 16oz 2% Chobani plain Greek yogurt. This is one of my all-time favorite meals, I crush it every single day. Lots of active cultures, good blend of protein, tons of fiber, antioxidants, omega-3′s, it is all there. This is another staple that I have almost daily. Tony has a twist on it where he puts in pumpkin too, but I prefer my pumpkin cottage cheese mix separately. Another awesome low-carb meal to finish the night. Delicious and nutritious. So there you have it, a normal intake for me on a training day, I also have some more random green tea intake on most days. On a non-training day I would drop the shake and banana meal, have the yogurt around 10-10:30ish, then I would have my pesto chicken wrap lunch at roughly 2 maybe with the apple maybe without, followed by the cottage cheese around 6, and the final meal at the same time as above. Pretty simple really. If you have any questions or thoughts, don’t be shy! I only have time for a quick one today, but it will be well worth it. I wanted to give a shout-out to a new blog that I think a lot of you would enjoy. One more interesting thing to read instead of doing actual work. I urge you all to check out former CP intern Roger Lawson’s blog, http://www.roglawfitness.com/. Roger was actually an English major in college, and it shows in his writing. He makes me feel like such an amateur. Roger was an awesome intern, with great energy, enthusiasm and passion to learn, and that has carried over perfectly to his blog and writing. The man has already written an article for Alan Aragon’s Research Review! That is phenomenal. I will end this with a video of the great Roger Lawson (who’s dad actually played in the NFL) getting absolutely dominated by the final Intern Hazing Circuit. Enjoy! As many of you know I have a sizable commute to work everyday, usually averaging 1:10 to 1:15 each way. Needless to say I spend a lot of time in my car every week, a stunning 1999 Ford Taurus. I listen to a lot of podcasts, sports talk radio, and now I am starting up on audio books. 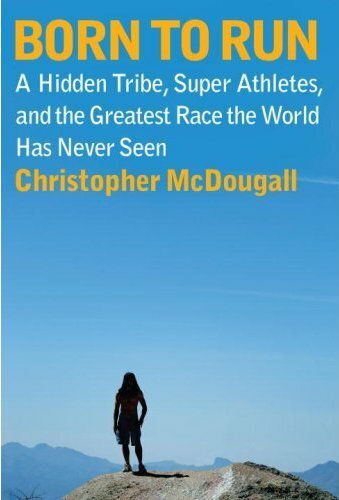 I most recently just finished the book Born to Run by Christopher McDougall (audio version here). I have been wanting to read it ever since it came out, but considering that I have been working on the incredible Good Calories, Bad Calories (review coming eventually) for several months now it was destined to not be read for a while. Fortunately EC picked it up in the unabridged audio book format, and I was able to toss it on my iPod and give it a listen. This book is absolutely fascinating. It intertwines stories of fantastic ultra-marathons with facts and theories about human evolution in a riveting, multi-layered approach. McDougall tells much of the book from a first hand account, and he just brings his story to life, making it so vivid and real you feel as if you are running along side him. There is even some nutrition info in the book. Some is decent, some is absolutely terrible and false, but that is one of the few stumbles. When he gets to the theories about humans having evolved to be the greatest running machines on earth, with our ability to persistence hunt, it is utterly spellbinding. I urge anyone, whether a runner or not (I am as far from one as is humanly possible) to give this book a read, or as in my case, a listen. It will capture your imagination. The title says it all. This is one delicious dessert, and can even be used in place of morning oatmeal, and it is absolutely delicious. This is my fiance’s recipe that we have continually modified to make ever healthier, and it gets better every time! Spray a 9×9 pyrex pan with 1 tsp extra virgin olive oil (I like the Misto sprayer). Stir the Apple Mix until evenly distributed, and then place in the pan. Cover with the Topping, evenly distributing. Bake in pre-heated oven at 350-375 degrees for about 35-40 minutes or until apples are tender and topping is browned. Optional – you can sprinkle in some milled flax for extra fiber if desired or some raw chocolate nibs, maybe add in some unsweetened shredded coconut, the possibilities are endless! Tuna: Great Food or Death Trap? Tuna seems to be a food that falls on two opposite ends of the spectrum. Some people eat it like it is going out of style, while some avoid it like the plague. Tuna is a great source of protein, the cancer-fighting selenium, vitamin B-12, with some omega-3 fats. These are the benefits of tuna. The downside is that it contains a fair amount of mercury, depending on the type. The two real options are white tuna, and light tuna. Though there are variations of each, these are the two main differences. White tuna comes from albacore tuna, a large species with a fair amount of mercury. Light tuna usually comes from skipjack tuna, a smaller species with significantly less mercury content. Though a small amount of light tuna also comes from yellowfin tuna, which has roughly equal mercury content to that of albacore. The albacore has a higher fat content and therefore more omega-3′s and fat-soluble vitamins, but I would say this is off-set a bit by the higher mercury content. For adults 1-2 cans of albacore per week is completely acceptable and well below the risk area of mercury issues. For pregnant women and children, please refer to this stance of the FDA. While I do think the FDA is very conservative in their advice, you can obtain all the nutrients in tuna with less risk than eating more than 1-2 cans of albacore per week. Light tuna has a significantly lower fat content, meaning only small amounts of omega-3′s, while also only having about 1/3 of the mercury content on average (unless from yellowfin). Light tuna can be eaten more often than albacore due to its lower mercury content, so 3-4 cans per week should not be a problem whatsoever. I hope that helps clear up some of the confusion surrounding tuna safety, intake, and the best choice to make. I work with a ton of high school athletes on their nutrition, it is a daily battle just trying to get these kids to wake up 10 minutes earlier to have something, anything for breakfast, let alone a good one. I have come up with lots of tricks and ideas to make it happen but it is certainly not easy. For you parents out there struggling with the same problem, here are some of my top tips to improve your kids school-time eating habits. Ideally if your child is an early riser, teaching them how to cook is a tremendous opportunity and great life skill. Show them how to make scrambled eggs or an omelet and breakfast is set for life. Rare is this the case unfortunately. If you are willing to make them breakfast, or if they cook themselves, here is a quick but healthy way to start the day: 3-4 whole pastured or omega-3 eggs prepared by choice, 1 Ezekiel English muffin topped with natural peanut butter and chopped banana and sprinkled cinnamon, a few glasses of water. Protein, healthy fat, high quality carbs and a piece of fruit; it’s a beautiful thing. For the kid who has to make his own in approximately 2 minutes I usually recommend a delicious breakfast smoothie. Something along the lines of 1 blueberry Greek yogurt, 1 scoop vanilla protein powder, 1 cup frozen berry medley, 2 tbsp walnuts, and 1 tbsp milled flax seed, with roughly 4oz water. 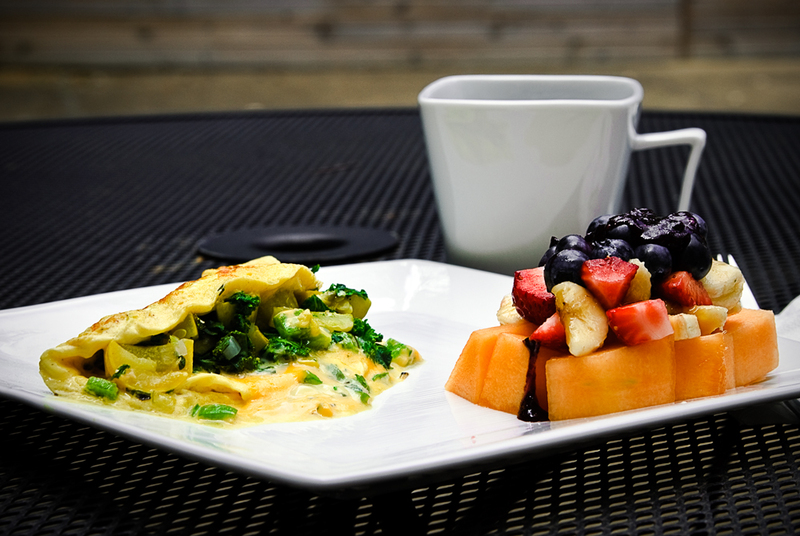 Quick, easy and provides a ton of quality nutrition to start the day. It can be tough for a lot of kids to squeeze in a snack at school, often due to no snack break (which I think is terrible) or lack of preparation (which just pisses me off). When I was in high school we had snack break at like 9:15 everyday, and I crushed a chocolate chip muffin everyday. Good stuff huh? Anyway, here are some school friendly snacks to get your kids eating right. 2-3 pieces string cheese (ideally organic or if possible grass-fed) with an apple. Quick, easy and surely better than a chocolate chip muffin. 2-3 hardboiled eggs (omega-3 or pastured) with some baby carrots and hummus. 1 Greek yogurt with celery sticks and 2tbsp natural peanut butter. Lunch and Dinner should be healthy options based around protein, some healthy fat, maybe some healthy carbs, and lots of fruits and vegetables. I gave more specific guidelines here and here. If you want more quick and delicious recipes for your entire family to enjoy I highly recommend checking out Gourmet Nutrition. It is the best cookbook on the market and can show you how to really spice up your meal planning. Enjoy! In the past I have blogged all about why I think probiotics are so essential for optimal health (here and here). Due to this strong belief in there effectiveness I eat a 16oz Greek yogurt everyday. I toss in some blueberries, chia seeds, and some mixed nuts for a delicious and satisfying meal. The gastrointestinal system comprises 75% of the body’s immune system. There are more neurons in the small intestine than in the entire spinal cord. It is the only system in the body that has its own, independently operating nervous system, called the enteric nervous system. If you stretched out the gastrointestinal system in its entirety, it would have the surface area of a regulation sized singles tennis court. There are over 400 species of microbes living in your gut, totaling over 15 pounds of mass and containing more bacteria than there are known stars in the sky. The last point relates a lot to the importance of probiotics and their impact on your health. The fact that there is more bacteria in your GI tract than there are known stars in the sky is insane. So lets ensure that it is beneficial bacteria making up that population. You can do that by eliminating processed foods, eating a lot of fruits and veggies and by consuming cultured foods like yogurt and supplementing with probiotics. A brand I really like is Integrative Therapeutics Probiotic Pearls. I have found that just consuming one of these every day has greatly improved my digestion and the digestion of my clients. My fiance and I were perusing through Gourmet Nutrition the other day and came across the Banana Nut Squares. We hadn’t tried these yet, they looked delicious and we happened to have 3 bananas getting pretty ripe sitting in our fruit bowl. So we set about making some for the week. Since we had 3 very ripe bananas, we had to double the recipe. This was fine with me because it gave me more wiggle room to modify it to my liking! The recipe (doubled) called for 4 cups of walnut meal. I love walnuts and all, but that seemed a bit over the top. So we got creative. I am more of a little of this, a little of that kind of cook, so we didn’t actually measure everything else we added, we just made sure it came out to about 4 cups total. We used roughly 3 cups of walnut meal, maybe a little less. 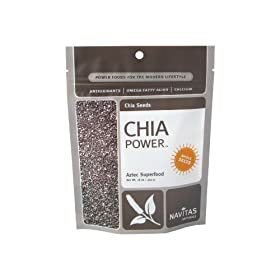 The last cup was made up of chia seeds, milled flax, and unsweetened shredded coconut. This gave us a little more fiber, an increase in omega-3′s, less omega-6′s and a little healthy dose of saturated fat to top it off. Needless to say, they came out awesome. Pre heat your oven to 350 degrees. Whisk the eggs and combine with the banana, cottage cheese and vanilla extract. Combine all dry ingredients and stir until mixed. Slowly add wet ingredients to dry and combine until well mixed. Be patient, it takes a while. Lightly coat a 9×9 pan with the olive oil. Bake for 10-15 minutes. Really make sure to not overcook as they will dry out. This makes 4 large or 8 small servings. Enjoy! For more great meal and snack ideas like this, check our Dr. Berardi’s incredible Gourmet Nutrition 2.0. It seems lately that coconut water is all the rage for post-training replinishment. Due to its natural sugar content, high electrolyte content, and general overall deliciousness, people are declaring coconut water to be the greatest post-training drink ever. Is this actually the case? I will end the suspense now, as no, it is not. While I do not have an issue with people consuming coconut water in conjunction with some protein and maybe a little healthy fat, it is not the holy grail of hydration some make it out to be. I will state that I am a huge fan of coconut. I love the oil (extra virgin organic kind), I love it unsweetened and shredded, and even the milk to a degreee (again the organic kind). Coconut is a great food, and the water is no exception. The only issue is that it is not cheap, and is it actually any better than say a banana post-training? I am not convinced. In my mind for most people there is no need for anything too special post-training. For general fitness enthusiasts what do you need after training? You need a blend of high quality proteins, preferably anywhere from 20-40+ grams, depending on size, training session and goals (a whey and casein blend works wonders here). You also may need a blend of high quality carbs, though they don’t need to be fast acting (unless you have another intense long-duration session within 8 hours), and need really depends on goals. A little healthy fat doesn’t hurt, and some has been shown to actually increase muscle protein synthesis. Lastly some electrolytes to top of the re-hydration process would be a good idea as well. We want all this, but we also want it to be reasonably priced. You could make an insanely expensive version, but is that extra cost really worth the assumed extra benefit? Who knows. To me that is an awesome post-training shake. Granted this is more of a caloric intake for a decent sized male, women may want to halve this. It provides everything we stated we needed for recovery. You have a nice blend of protein, roughly equal amounts of whey and casein. You also get a nice blend of carbs, with mainly glucose and fructose, providing muscle and liver glycogen. This smoothie also provides a very nice assortment of electrolytes and minerals including sodium, potassium, magnesium and calcium in abundant quantities. The yogurt and walnuts provide some awesome saturated fat and omega-3′s. For some nice bonuses, the fruit also gives us a nice dose of antioxidants after a stressful training session, the blend of glucose and fructose (rather than just straight glucose) increases hydration status, and the yogurt tosses in some gut-friendly bacteria. All in all, I think this provides us with everything we need to recover, is a reasonable price and is certainly healthier than just whey with some simple sugars. It also provides more benefits to me than just coconut water. You can also make this shake even healthier, depending on your budget. You can make the yogurt organic or even raw (regardless it should be from a company that does not use hormones), you can choose whey from grass-fed cows treated at low temperature, you can choose organic bananas, and organic local strawberries. The list can go on. Essentially you can keep adding in luxuries if it is within your budget, but they aren’t completely necessary. That is also how I feel about coconut water. It is a luxury, not a necessity. If you can afford it, great, toss it in a smoothie and enjoy it. If it is outside your budget, then I don’t see this tremendous need for it. It is a fine product, but, like most things in the fitness world, it is not the holy grail many tout it to be.